Coldplay, Meat Loaf and Grace Jones are among the acts attending the Q magazine awards in London. 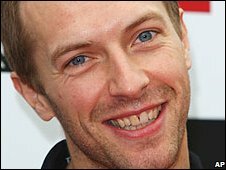 Chris Martin's band are up for four awards at the ceremony, including best album and best act in the world today. Vampire Weekend and The Ting Tings have three nods each, while Kings of Leon, Nick Cave and The Last Shadow Puppets are up for two prizes each. The ceremony, which is often a raucous affair, is being held in London's Grosvenor House hotel. Meat Loaf turned up at the ceremony sporting a cut eye and looking unwell, telling reporters he would have to visit a doctor because he was suffering from vertigo. Previous years have seen Elton John accuse Madonna of lip-synching and Liam Gallagher branding Chris Martin a "plant pot". Both nominees and winners are selected by readers of the monthly music magazine. Coldplay's other nominations come in the best track and best video category for their song Violet Hill. The group's most recent album, Viva La Vida or Death and All His Friends, has already sold in excess of 600,000 copies since its release in June. Vampire Weekend are up for best new act, best video - for A-Punk - and best album for their eponymous debut. The Ting Tings are also up for best new act as well as best track and best video for That's Not My Name. In the best album category, Vampire Weekend and Coldplay are up against The Last Shadow Puppets' The Age of the Understatement and Dig!!! Lazarus, Dig!!! by Nick Cave and the Bad Seeds. The album list is completed by Seattle five piece Fleet Foxes with the harmonic folk of their self-titled debut. Last year, indie rockers Arctic Monkeys were named the best act in the world and Amy Winehouse scooped the best album prize for Back to Black.